After some discussion and a bunch of keen rehearsals we performed our very first Beatles show on April 3rd, 2013 at the Budapest Muzikum venue (a.k.a. "Kossuth Klub"). After the unforgettable night it was no doubt that Muzikum will be our steady site for our monthly club shows. It's been close to 20 of The Bits performances so far at Muzikum, all shows full house and often sold out. Each and all of the monthly club gigs are dedicated to a unique theme such as "John Lennon Night", "Beatles Xmas" or the 50th anniversary celebration of Beatles LPs "A Hard Day's Night Live" or "HELP! 50". 2013 June 27, 3/4 of our fab four appeared at Paul McCartney's arena gig in Vienna for some case studies. 2013 summer, we performed at the main stage of Budapest biggest open air venue Zold Pardon, it was an extremely hot day... A bit later our 1st show at the Budapest Varosliget Park Beer Tent, this became one of our main scenes for our Budapest Summer shows. We performed at the biggest summer camp of Lake Balaton. We started our summer festival row at Hegyko with a huge show and were hardly released from stage by the outstanding audience. Almost 1K fans liked and follow us on Facebook, we closed the summer season at a huge open air scene taking place in the beautiful garden of the Hungarian National Museum, it was a night to remember and an amazing crowd singing the Beatles songs. 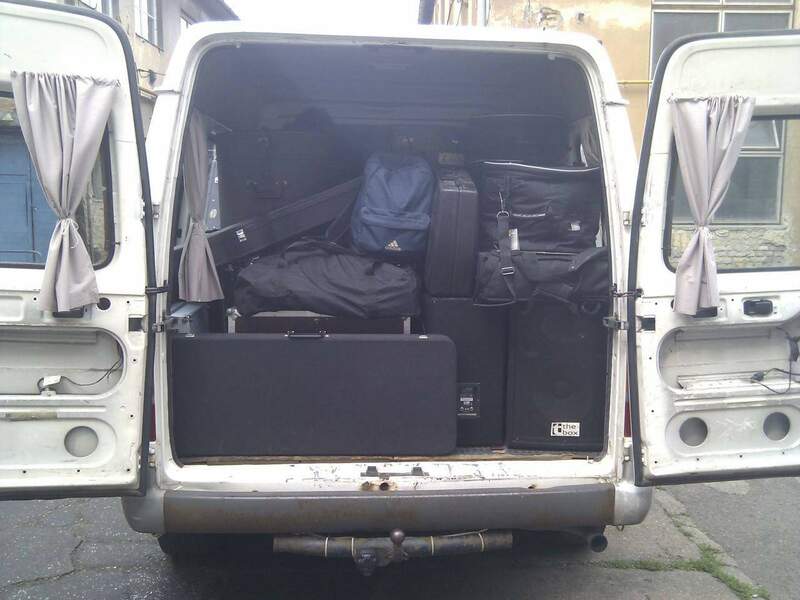 From the very beginning, The Bits is traveling both in Hungary and abroad with our good friend Laszlo Margitay-Thurzo and his band transportation company and brand Haknibusz (gig bus). Laszlo is not only our driver, roadie, security guy, merchandise sales representative, interpreter, photographer, psychologist, advisor, one of the honorary 5th band members, but also one of the biggest local fans of Bud Spencer and Terence Hill films, so it is an easy and smooth cooperation with the band. One of the many moments for Laszlo's routine, skills and patience was a big festival at Lake Balaton, where he slowly drove across thousands of people towards the stage step by step while all band members were praying for their lives in the back of the bus. Along with studying more and more Beatles tracks, during September 2013 we started the rehearsals for the A Hard Day's Night Live show. During autumn 2013 we performed at the biggest Hungarian music- and instruments fair, Music Expo Hungary, then we had a great concert eve celebrating the birthday of our band member Janos with not only Beatles songs. We had a special guest visiting our monthly Muzikum club gig, Miklos Galla is one of the biggest Hungarian humor icons and also the main local representative and step father of all Monty Python and English humor, he was the one who interpreted all the Flying Circus episodes and other Monty Python films. We were very proud to have him at the show and his nice words and comments of his 1st experience with The Bits. 2013 October, the band moved to the roof top of the Budapest downtown house where Bali lives and filmed the promo video of our A Hard Day's Night cover we recorded earlier. The promo video of day- and night changing shoots brought nice welcome and big number of views both in Hungary and abroad. 2013 December 7, The Bits performs a night dedicated to the memory of John Lennon at Muzikum with only Lennon songs. It was not only a night to remember but the one and only The Bits show so far when Bali played his vintage Ludwig Clear Vistalite drum kit. 2013 Xmas - New Years Eve season, we had a bunch of nice, relaxed rehearsals getting ready for our very first Beatles unplugged show to kick off.It was a not only the first of our unplugged shows, but the first time we had a double full house so far. It was so much fun to present the Beatles songs in a more unbound way with lots of space for several tiny instrumental add ons. 2014 end of January, The Bits appears in the "Kultikon" program of the Hungarian Television promoting the A Hard Day's Night Live show. 2014 February 8, A Hard Day's Night Live show at Muzikum celebrating the 50th anniversary of the famous Beatles album. We played the full album in authentic track order and some extra add ons, it was a night to remember with an outstanding full house audience. The concert sound was recorded for a later release. 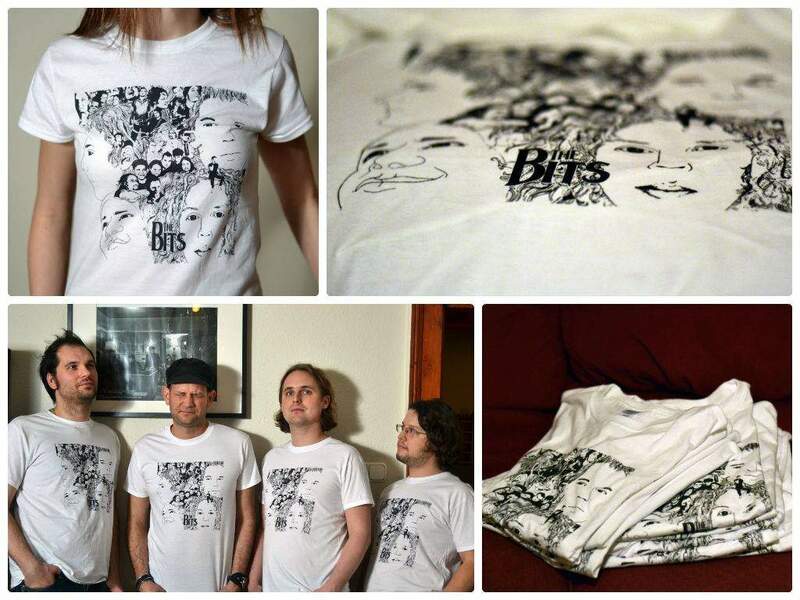 2014 February, our own version of "The Bits Revolver" graphic designed by Eszter Budavari is finally ready and soon available on band T-shirts and The Bits merchandise. Most of The Bits photographs are shot by Renata Pusok, who is not only the photographer, but also designer of the band flyers and time to time helps on other roles as guitar technician or tour manager. Her and Eszter's photos can be found on The Bits' Facebook page. 2014 March rehearsals with musician friends getting ready for "The Bits and Friends" show of April 5 at Muzikum. 2014 April 10, The Bits plays a huge university gig at the ELTE University. Showing the success of the show The Bits returned 6 months later again for an encore show. 2014 June 9, release of the earlier recorded A Hard Day's Night Live concert album CD. 2014's busy summer highlights. A challenging day with a big rush for a festival in the country, Janos jumps in the running band bus after pushing his broken car in the Budapest Friday afternoon rush hours traffic jam, we hardly made it but started just on time after a 200 kilometers run. Same day another run after the show to catch Gillby Clark playing another big festival in the country. 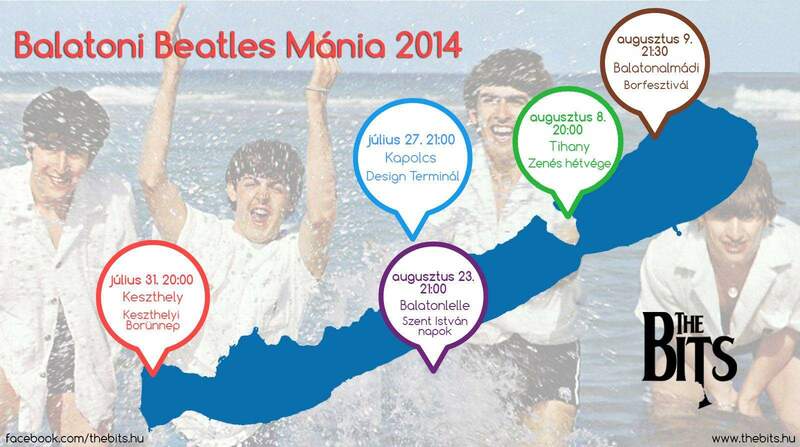 2014 June kick off of our "Lake Balaton Beatles Mania" tour with 5 venues covered around the lake. 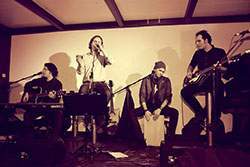 End of July, The Bits plays at the "Kapolcs Valley of Arts" festival with two gigs and long lasting unforgettable jam sessions each night joined by musician friends. 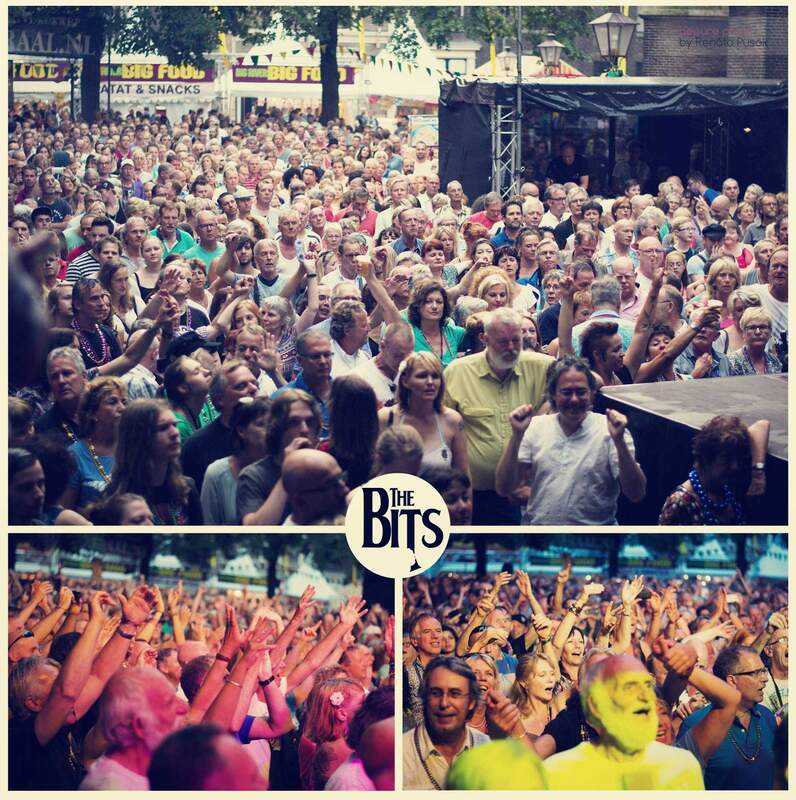 2014's biggest act was our Holland tour starring at the Big Rivers 2014 Festival in Dordrecht, The Netherlands. It was a long-long trip in our favourite band bus with the only ease of some cool "Palinka" shots. We performed our A Hard Day's Night Live show at a cool local live venue that was previously the local mad house (Dolhuis). We had rehearsals with the local winds orchestra and chorus and performed a big Beatles medley set on the festival's main stage. It was our pleasure to be the main and closing act on the main stage playing for a brilliant and huge audience. Due to the recent tragical Dutch plane accident we were asked to break the show with a minute of silence remembering and then continue with Imagine with thousands of people singing along with us. Fortunately a number of festival videos are available on Youtube to share and remember the outstanding moments of these concerts. A strange bit of the Holland tour was the unusual extreme hot weather we wouldn't expect from the Netherlands. We travelled, rehearsed, performed and slept in extreme heat and made the funny but real metaphor "hot like in Holland". On our way back home we made a stop at the Höfner Guitars factory, manufacturer of the world famous violin bass of The Beatles. The Bits were honoured by Höfner to become a Höfner Artist and instrument endorser. 2014 August we were the supporting band warming up the audience at one of the biggest Budapest outdoor live scene, the "Park". We closed the summer back in the "Varosliget Park Beer Tent" with a nice audience and some real unplugged ending and single guitar sing along (due to the after 10 PM sound limitation). 2014 summer brought a lot of rain and after a number of wet gigs, we were lucky to play our very last outdoor gig of the year at the National Museum garden for a huge crowd before starting the autumn club season. 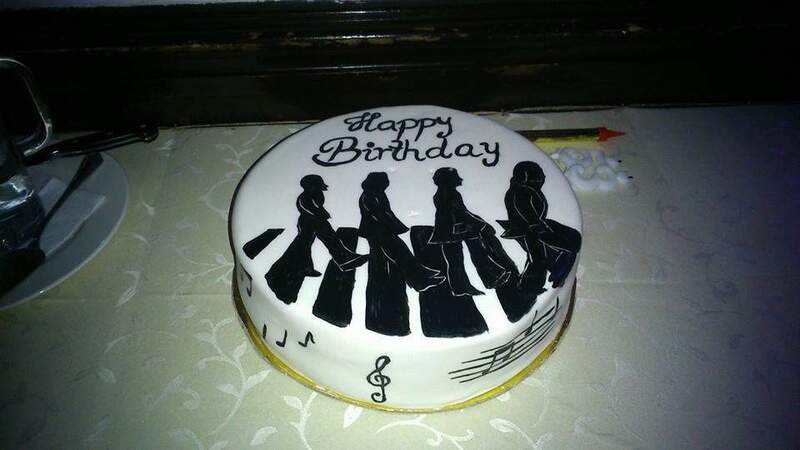 2014 end of September a surprise birthday party for Zsolt, lots of good jamming and lots of cakes. 2014 New Years Eve, we celebrated with a 3.5 hours double concert, one gig in 2014 and another in 2015. 2015 February was an unplugged month again with a pre-sold out night at Muzikum and other unplugged concerts in the country. 2015 March rehearsals and performance of the HELP! 50 show, playing the full album in track order along with extras. We also appeared in Hungarian TV- and radio stations promoting our HELP! Live show. During shows and rehearsals we sang "Yeah, yeah, yeah" for 185 times and "nanananaaa" for 178 times"
Almost 5K Facebook likes and followers, thanks you!